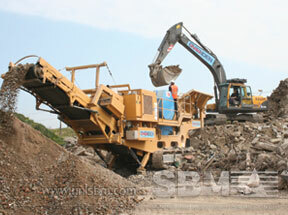 SBM Machinery designs the track mounted crushing plant for the clients with high mobility. SBM Machinery manufactures and exports the state-of-the-art models of track-mounted mobile crushing plant for different materials and output. The major trump cards of track mounted crushing plant are versatility and flexibility in application as well as in terms of movement. Mobile crushers are loaded on their own crawler tracks or towed by truck horse when transported over longer distances to a new location. With tremendous flexibility and compact design, you can take this machine directly to rock crushing plants or demolition sites for powerful, handy recycling of reusable construction materials, concrete debris, sand and gravel with economic efficiency. The track mounted crushing plant is featuring environmentally friendly, higher mobility at the operation site, low costs, heavy-duty diesel engine, toughest proven crusher, proven power distribution system, easy to operate etc..
SBM has the right crusher and crusher parts to meet your material reduction requirements for domestic and export markets. The Mayoko iron ore project lies on the Precambrian Congo Craton of West Africa. Iron is hosted within highly weathered iron-rich metamorphic rocks referred to as 'Chapeau de Fer' or hats of iron. A hematite and magnetite plant will be required to process the ore. The track mounted mobile crushing plant from SBM Machinery can help the miners to process the hematite in a two-stage crushing circuit. "The crawler type mobile crusher from SBM Machinery is a kind economic and practical substitute for the conventional mobile crusher in European market." The Gaoua project is located at Southern Burkina Faso. The project area lies within the Boromo greenstone belt. The belt is an early Proterozoic Birimian sequence of the West African Craton. SBM Machinery supply the tack mounted mobile crushing plant to process the mineralization breccias such as copper-gold mineralisation , Cu-Au mineralisation for the Gaoua Projects. The crushing capacity can reach 700 tons per hour, the fineness will be down to 5 mm for further processing. "Track mounted crushing plant is the most conveniently crushing plant our group ever used. 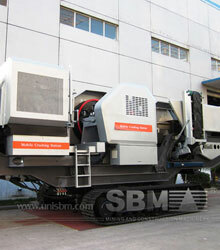 The products of SBM Machinery is good."